Sorry, I don't get it. What does iOS12 have to do with scripting? I'm not aware of any scripting capability on the iOS devices. Please provide details. The screenshots don't tell me much. He is referring to Siri shortcuts I believe. Now this is scripting that I can do! I loved the Workflow app before Apple bought it and look forward to playing with it. Thank you for sharing the screenshots. 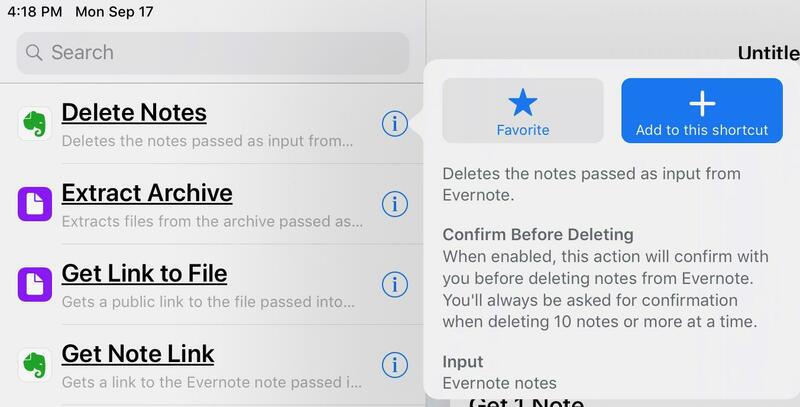 When it was workflow I could save files to a new note and the files would be saved in the order selected. No more. I’m not sure what order is being used. Does anyone? also I used to save a CSV file to a note. Now, the contents of the csv is saved, but not as a file. Any clues on that? "Create Note" does exactly what I want (thank you! ), but it doesn't launch Evernote and present the note. What step am I missing? Thanks for your post on scripting, @Sayre Ambrosio. I would like to learn more about it. @DTLow is the one who originally posted the shortcuts scripting. ? that’s who you want to ask. I’m still learning myself. Thank you, @DTLow for being a script master. ? I am learning so much from your posts! A word to the wise, if you create these on one device like an ipad, the same voice shortcut won't work on another device like an iphone. At least not for me. When get images using "Get Notes" and "Get Images from Input", always got image format is PNG. This problem no happening other shortcut commands (ex. "Find Photos"). 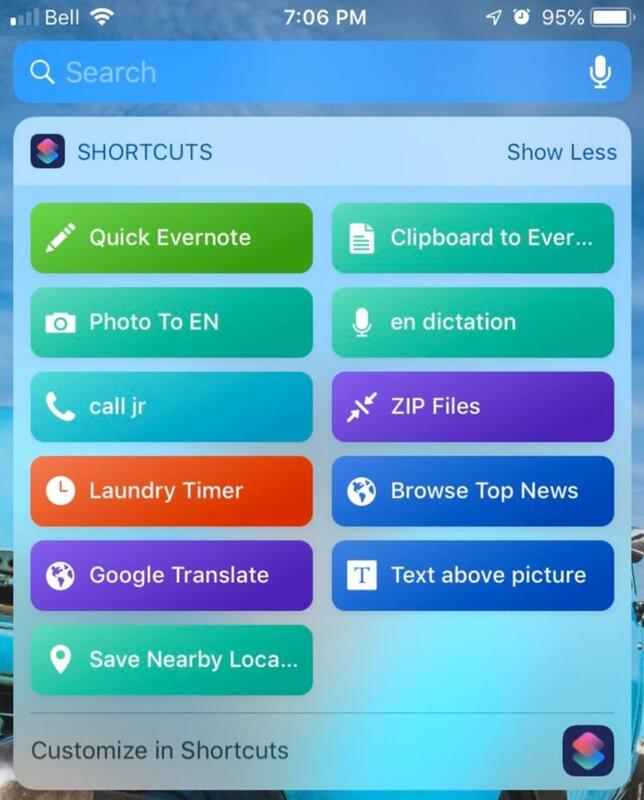 Who's got some good EN shortcuts to share? 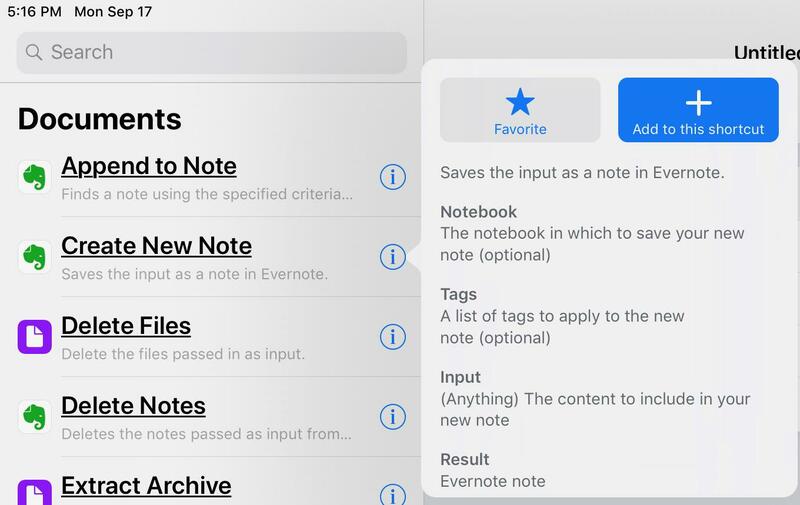 "clipboard copy to evernote new note"
Wish I could pull a list of notes with a certain tag - anyone know how to do that? I’m trying to use the “create new audio note feature” but I’d like to have a file name automatically generated based on variables in my shortcut. I can’t figure out how to do it though. Has anyone figured this out? So Siri shortcuts just quit working for me. All the notes I've created voice shortcuts to open on will not open the note. Siri does recognize the voice shortcut, but just tries to search the web or open apps with the same name. I've looked in all the notes with voice shortcuts and under “edit Siri shortcut” the same command is still there. Since there still isn’t parity between iPhone/iPad etc voice shortcuts for the same note, i’ve only been using iPad for them. Anyone else experienced this? Notes are often not loading when using a Siri Voice shortcut to open them. These offline notes are able to be pulled up, then fail to render. What's weird is I can pull them up and they render fine with a non-voice search in EN. Anyone else experienced this? 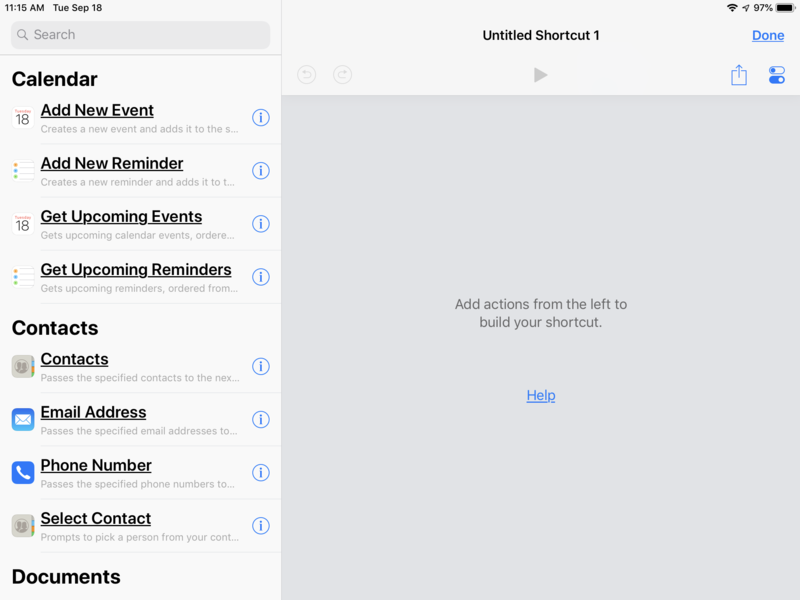 Shortcuts is nothing new (the app existed for a while before Apple bought it), but the Siri integration introduced with iOS 12 is. @bounce: Activating a workflow with Siri is not the same as controlling the app itself by Siri. Basically the workflows (= scripts) can be taken from a gallery and be adapted / modified. Or you can create them from scratch, and add them to your personal library. Because Siri is always restricted to the device, calling a workflow by voice has to be trained on each device. The workflow in itself can be transferred from one device to another, but the voice activation does not go with it. 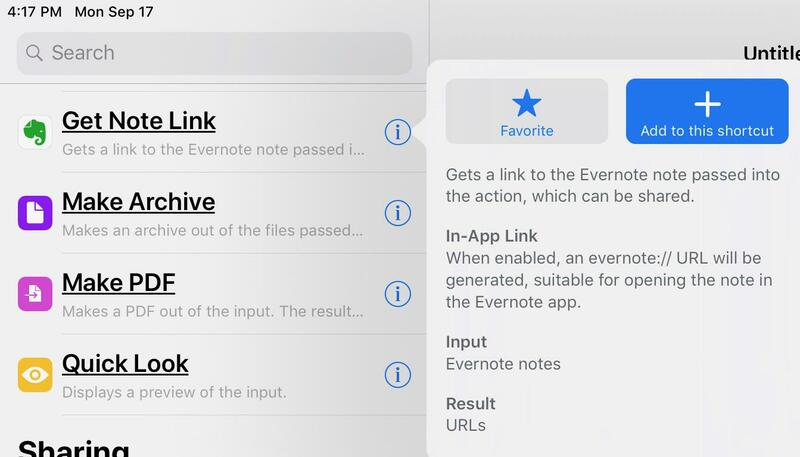 The voice command must not necessarily match the shortcut: You can train to say „bubblewup“ to create a new Evernote note in the Inbox and put the content of the clipboard inside. 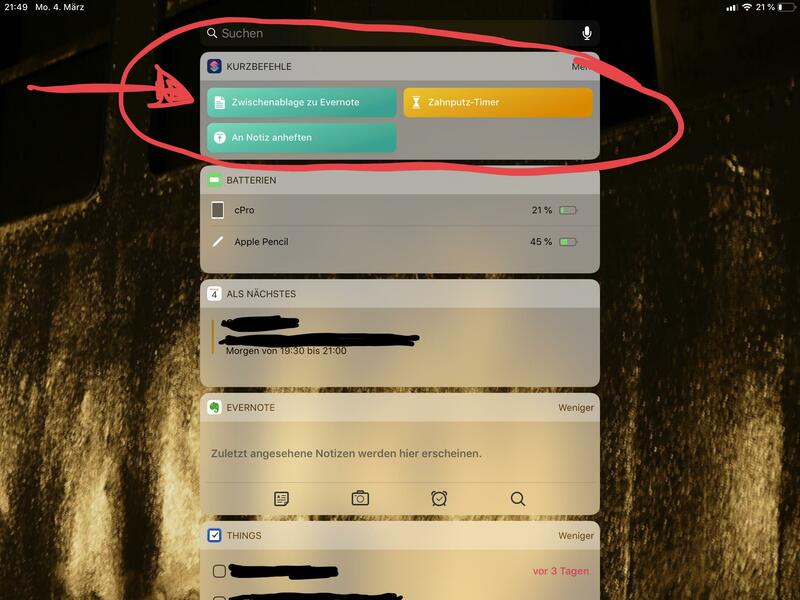 What is nice with shortcuts: Workflows can be called from a widget on the lock screen. By this, workflows inside your personal library can be activated (manually or with Siri) without even unlocking the iOS-device (See screenshot). The workflows created can do much more than the predefined widgets that may come with an app. Not all workflows go into the widget, only those you choose to activate for this option will show. For a start with scripting under iOS, the best way is to pick an existing workflow from the gallery, and modify it. Yea, I have nearly a hundred workflows (not related to Evernote) that I've made over the years in the workflow app before it was bought by Apple and became shortcuts. 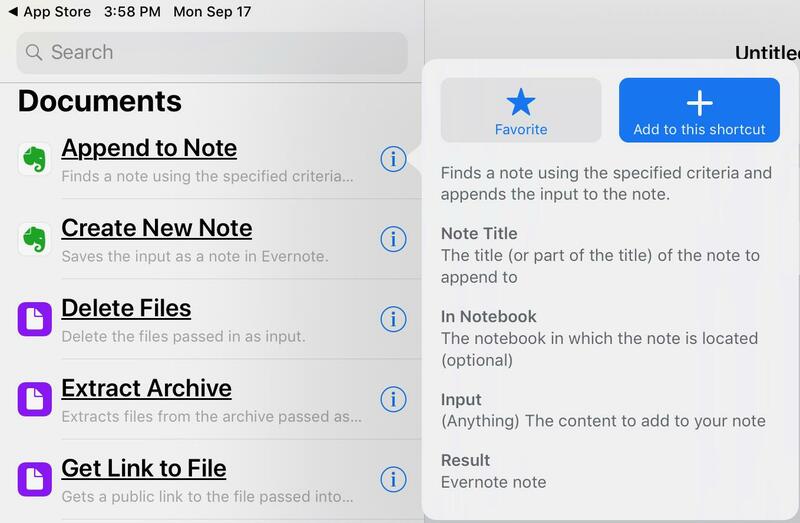 I'm referring to Evernote's baked in option for Siri to directly open notes via voice. The way you can, from within an Evernote note, record a phrase to open that note with voice command. Often, when calling the voice command for a note, the note will pull up via Siri, but all the text won't render - the note just sits there spinning. Notes use to pull up fine, they sometimes still do, but often they do not render. 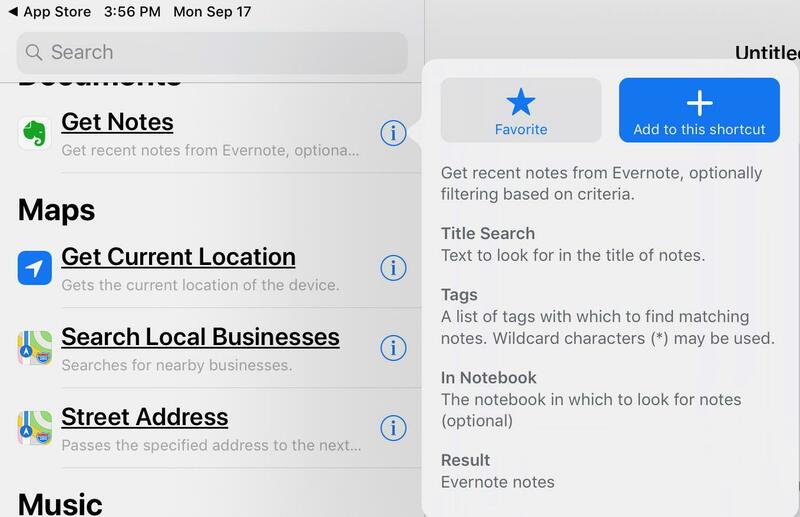 Notes almost always render when they are accessed with a text search. Yes, same with me: Initiating a workflow through a trained command is one thing which works most of the times. But talking something into Siri in a combination of commands and input for transcription can make a frustrating experience.